EU ban on single-use plastics aims to stop unending stream of plastic pollution making its way into oceans. There are second-long decisions that every person makes in the course of a single day. You rush to the office – late again – and stop for a takeaway espresso. For lunch, you eat a quick salad from a disposable container. On your way home, you stop at the supermarket and buy ready-bagged fruit and veg. And back home, having dined and wined your daily grind away, you treat yourself to a tub of ice cream. These decisions take seconds to make – and yet they translate into millions of tonnes of plastic which take centuries to degrade in the oceans, where they are also consumed by marine life. Plastic is an innocuous part of our life. It is almost hidden from view and in the shape of plain takeaway boxes, conveniently small straws and cotton buds. And yet, plastic is everywhere, so visible that it’s almost ‘invisible’. It’s the background material to modern life, present in clothing, cars, toys, packaging, even as adhesive to seal most teabags. Around 340 million tonnes of plastics are produced every year, worldwide. And a lot of it ends up as pollution. 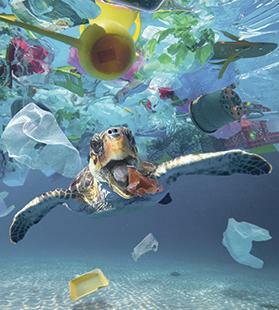 More than 150 million tonnes of plastic exist in the oceans today, with 4.8 to 12.7 million tonnes added every year. The Mediterranean is not immune. In a report released last June, entitled Out of the Plastic Trap: Saving the Mediterranean from Plastic Pollution, the WWF warned the Mediterranean is at risk of becoming a ‘sea of plastic’. Indeed, some 95 per cent of waste floating in the Mediterranean and lying on its beaches is plastic. The effects of plastic pollution are dramatic. Large plastic pieces injure, suffocate and kill marine animals, including protected and endangered species such as sea turtles. Microplastics – the more insidious fragments – have reached record levels, with a concentration of 1.25 million fragments per square kilometre in the Mediterranean Sea. Microplastics enter the food chain and threaten an increasing number of animal species – ingestion of plastic particles can prevent species from digesting normal food and might attract toxic chemical pollutants to their organisms. Humans stand at the top of the food chain – that doesn’t mean plastic will not reach back up to the top of the food chain. In fact, a trial at the Medical University of Vienna last year found tiny shreds of plastic in the digestive systems of people from eight different countries. The consequences and effects of eating plastic on the human body could be devastating, as studies have shown plastics in the ocean soak up toxins from outside sources before entering the ocean. These chemicals are ingested by animals in the ocean - humans, in turn, consume the contaminated fish and mammals. Economically, the effect is also significant, with the Mediterranean’s global reputation for tourism and seafood under threat – this, in turn, puts communities who depend on various sectors at risk. The effects of plastic pollution have raised a rallying call for action – this has prompted the European Parliament to vote in favour of banning certain single-use plastics by 2021. This is part of the EU’s comprehensive strategy for plastic use in the EU – with the aim of reducing the impact of plastic consumption through a greater emphasis on collecting plastic packaging and increasing recycling. Single-use plastics – which include sandwich and burger boxes, food containers, straws, cups and cotton buds – are non-biodegradable products used just once and thrown away. According to the European Commission, plastics make up 85 per cent of marine litter globally, while single-use plastics and fishing gear make up 70 per cent of marine litter in Europe. Hence the EU targeting single-use plastics to prevent more plastic getting in the ocean and, in turn, putting Europe ahead of the curve on an issue with global implications. The effort to end plastic pollution in our oceans was one of the key themes of 2018, with European Union lawmakers ending the year with an agreement to ban certain single-use plastics by 2021. The EU ban is comprehensive and targets the 10 single-use plastic products – for which alternatives are readily available and affordable – most often found on Europe’s beaches and seas, as well as lost and abandoned fishing gear. The new rules are tailored to get the best results – different measures will be applied to different products. Where alternatives are readily available and affordable, single-use plastic products will be banned from the market. For products without straightforward alternatives, the focus is on limiting their use through a national reduction in consumption, design and labelling requirements, and waste management or clean-up obligations for producers. Moreover, manufacturers will need to contribute financially towards raising awareness and collecting plastic litter and fishing gear – a financial burden which so far has been mainly carried by public authorities. Aside from the 2021 ban on single-use plastics, by 2030, all plastic beverage bottles will have to be made from at least 30 per cent recycled content. Beverage bottles will also need to be collected and recycled at a rate of 90 per cent by 2029. The financial burden of collecting cigarette stubs will be extended to the producers of tobacco filters. Malta is preparing for the 2021 ban on single-use plastics. The Environment Ministry has requested ERA to draft a strategy which is in the same spirit as the EU ban but caters specifically for Malta’s circumstances. To lead by example, the government will also be providing direction to ban public procurement of single-use plastics in events organised by the departments and entities that fall within the scope of public procurement. Plans are also under way for awareness-raising campaigns including a specific one on marine litter and sustainable consumption on beaches targeting reduced consumption of single-use plastics on beaches. To make this work, a change in mentality is needed: using cloth and paper instead of excessive plastic packaging; giving children paper straws or ones made out of bamboo instead of plastic ones; using paper confetti during village feasts instead of plastic ones; and acknowledging that the result of plastic’s short-term convenience gain is a long-term harm to the environment and to us. 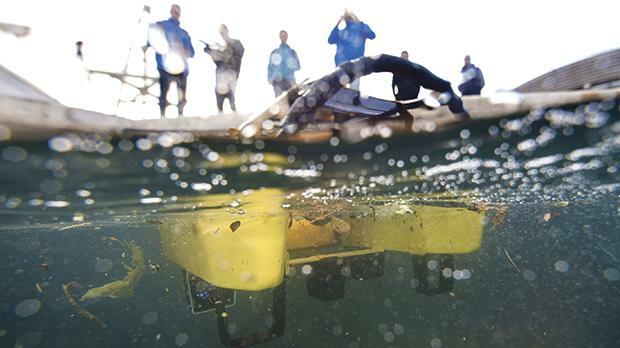 A Jellyfishbot, a marine robot, collects floating waste in the harbour of Cassis, France. Plastic ban on certain products: Where alternatives are readily available and affordable, single-use plastic products will be banned from the market. The ban will apply to plastic cotton buds, cutlery, plates, straws, drink stirrers and sticks for balloons which will all have to be made exclusively from more sustainable materials instead. Single-use drinks containers made of plastic will only be allowed on the market if their caps and lids remain attached. Consumption reduction targets: Member states will have to reduce the use of plastic food containers and drinks cups. They can do so by setting national reduction targets, making alternative products available at the point-of-sale, or ensuring that single-use plastic products cannot be provided free of charge. Obligations for producers: Producers will help cover the costs of waste management and clean-up, as well as awareness raising measures for food containers, packets and wrappers, drinks containers and cups, tobacco products with filters (such as cigarette butts), wet wipes, balloons, and lightweight plastic bags. The industry will also be given incentives to develop less polluting alternatives for these products. Collection targets: Member states will be obliged to collect 90 per cent of single-use plastic drinks bottles by 2029, with a 77 per cent benchmark set for 2025. Labelling requirements: Certain products will require a clear and standardised labelling which indicates how waste should be disposed, the negative environmental impact of the product, and the presence of plastics in the products. This will apply to sanitary towels, wet wipes and balloons. ▪ Plastic waste is increasingly polluting the oceans and according to estimates, by 2050 the oceans could contain more plastic than fish by weight. ▪ The Mediterranean Sea is today one of the seas with the highest levels of plastic pollution in the world. Plastics account for 95 per cent of the waste in the open sea, on the seabed and on beaches across the Mediterranean. This waste comes mainly from Turkey and Spain, followed by Italy, Egypt and France. ▪ According to an analysis by Plastics Europe – the association of European plastics manufacturers – Europe is the second largest plastics producer in the world, after China. ▪ WWF says that Europe dumps 150,000-500,000 tonnes of macroplastics and 70,000-130,000 tonnes of microplastics in the sea every year. The majority of these plastics enter the Mediterranean Sea, posing a major threat to marine life. ▪ Out of the 27 million tonnes of plastic waste produced each year in Europe, only a third is recycled. ▪ Plastic production – still 90 per cent dependent on fossil fuels – uses four to six per cent of all the oil and gas used in Europe. ▪ Eurobarometer statistics show that 87 per cent of Europeans are worried about the environmental impact of plastic. The European Parliament's plenary session will debate the single-use plastics ban next week and take a final vote with a view to the directive entering into force by 2021.